I am currently sitting in a hotel in Boise, Idaho. Hotels confuse me; they put me on edge. I feel kind of like an imposter. “We need to see your ID and your incidentals.” —My what? And I feel isolated. I have an enormous room, bigger than my soon-to-be apartment, and I linger in just one corner. I know there are people around but everyone is in their own rooms, their own strange bubbles. And all hotels look kind of the same. Last night I was in Laramie, Wyoming. The night before, Kansas City, Missouri. All entirely different cities, but I wouldn’t know from my lodgings. This is a result of me rapidly moving—as in, actually moving, my car is packed up with my belongings—across the country in order to be in Seattle to begin work. But given my discomfort, it’s pretty apparent that, despite my travels, I am not used to hotels. Nor do I want to be, honestly, and here’s why. I walked into the arrival hall of the basically empty Vilnius airport. One person was waiting, and they were waiting for me. 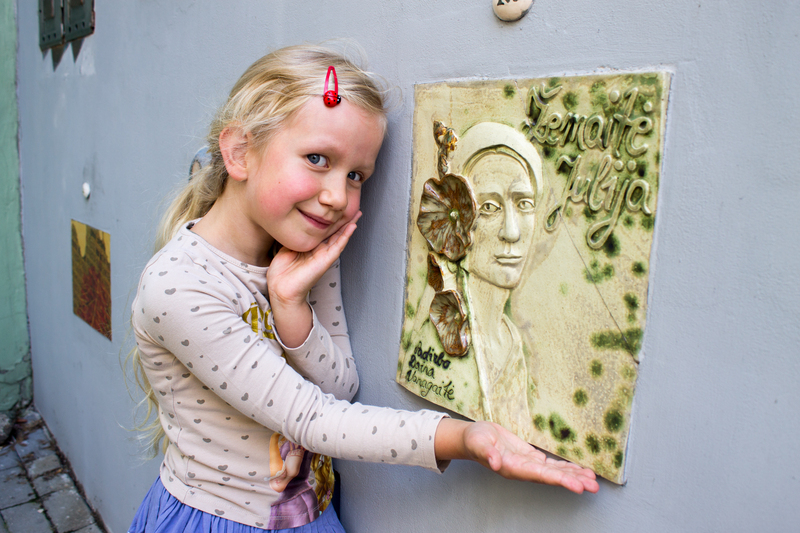 It was Evelina, my warm and clever host and friend. How did I know this Eve, who lives in a country that I had never before visited? Well, lest you think I’m crazy, let me describe my time with her first. 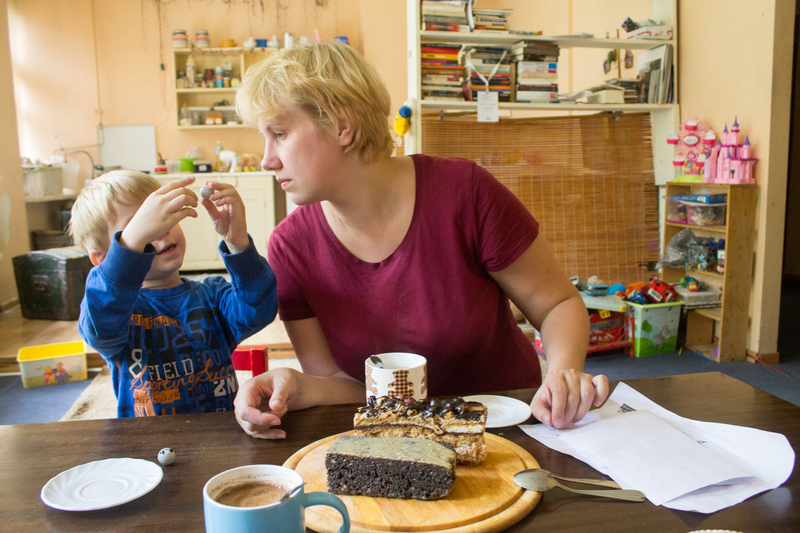 Eve lives in an apartment with her two kids, Maja and Lukas, very, very close to Vilnius’s old town. If I wanted to see the city, I just had to wander out of her building. If I was tired, I could traipse my way back. Eve works as a translator from home. When she wasn’t working, she was chatting with me or showing me around. Prime lodgings and a personal guide—you can’t pay for this! Or, maybe you can, but I can’t. Nor would I want to with the Eves of the world around. 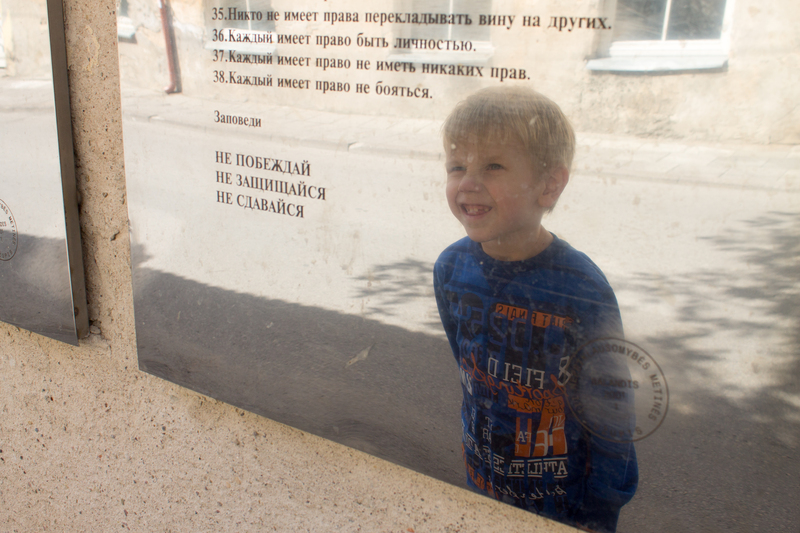 Lukas scrutinizing the constitution of Užupis. But it wasn’t the convenience of staying with Eve that made it wonderful—it was the connection. It was walking around Old Town with her and Lukas and Maja. It was Eve telling me about Lithuania while Maja and Lukas scrambled around, grabbing our hands for balance as they tiptoed along walls. It was Eve bringing me and the kids to a shop that sold truly the tastiest cakes. It was Eve patiently responding to all of my questions as we walked up to the three crosses above the city, despite the exertion caused by the steep ascent. It was Eve then bringing me for drinks after the hike, just sitting and chatting about a ton of stuff on the pub’s patio. It was evenings in her home, playing music for each other. It was Eve bringing me to a film screening by the Lithuanian Gay League—highly fascinating and something I would not have known about on my own—and translating the Q&A for me afterwards, like a true pro. It was us dancing at the after party. It was us stumbling across the Baltic Chain anniversary concert around midnight, and then walking back home with ringing ears, and even after we got home, Eve kindly showing my curious self additional information online. It is me wanting to go back, back, back. Vilnius is awesome. Lithuania is awesome. I loved the city and country for themselves, truly, because they’re beautiful—but unless you’re in the wilderness, places are shaped by their people. Vilnius is a charming city by its looks, but even more so by the character it has been endowed by its population. 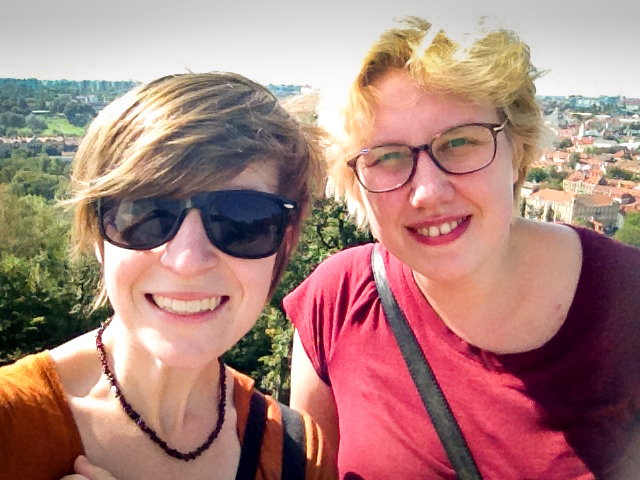 I want to see Vilnius again, but just as much, I want to hang out with Eve. Lukas showing Eve something in the presence of the best cakes. So, how do I know Eve? Readers know that I have utilized Couchsurfing to tremendous results, but it is far from the only, or best, avenue to find hosts and hopefully make friends. Eve and I were Twitter friends, thanks to our mutual admiration for the musician Patrick Wolf. When I made plans to come through Lithuania, she invited me to stay with her. And that’s that. Well, except it wasn’t really, because Eve put me in touch with my lovely host in Riga too. But that is another wonderful story. Eve and I, a selfie. Looking around, my hotel seems ever so sterile and bland and lonely. Alas, I have no time to hang out with an Eve. But next time. This is something I would never have considered, but your post has made me rethink it! This is nice to hear! Of course, it is important to somehow verify the person is who they say they are (in this case, it was clear because Eve saw other people I knew from Twitter at shows so there was a whole little network of people that couldn’t be fabricated), but once you’ve done that I think you’re in for a great experience. There’s a bit of risk in everything, but staying in hotels has no guarantees either – after all, you can’t verify that all of the staff are trustworthy! And there are websites like BeWelcome and Couchsurfing that make checking out potential hosts easy. I love this post! It’s really nice to know I’m not the only one who can’t stand hotel rooms! They are so cold and impersonal! Meeting new people and making amazing connections is one of, if not the best part of travelling! Thank you! And I totally agree. I think traveling and just staying in hotels is, often, somewhat limiting. Hotels definitely aren’t homey besides! I really enjoyed reading this. Your style is similar to what I hope to be writing like eventually. You really know how to take the reader into the story. Well done! Thanks so much! And good luck with developing your writing. My one tip would be to mimic the voice you hear in your brain, picking up on its little quirks and expressing them in writing because, well, that’s truly you! Aw! Well all of my Lithuania-related reviews are good ones. :) I would love to go back soon!